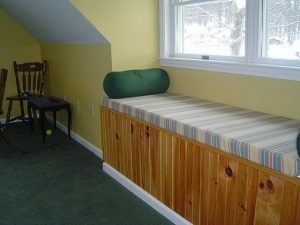 When I was looking for a cost-effective way to gain more living space, I looked at the attic area above my garage addition that I had put on to the side of my house a year earlier. I estimated the finished attic cost would be much less expensive than putting on another house addition on the other side of my house. There were several factors that I knew about, that would ensure my finished attic costs would be low. They are listed below. One of the main reasons I knew my finished attic costs would be low was due to the key fact that I already had easy access to my garage attic area. There was already a door opening area between the main house and the garage addition, with effectively a vestibule landing area between the house and the garage. The landing area was such that we could either step down 4 steps to the garage or step up 4 steps to the garage attic area from the main house. My garage addition was 26’ x 26’, and when I built it, I decided to include a large dormer, with windows, in the garage attic. When I built the garage addition, I had originally thought that I would use the garage attic area for storage, but that I wanted plenty of light in it and I wanted plenty of headroom. So, with the large garage footprint and plenty of headroom and natural light in the attic, the space lent itself nicely for doing a finished attic conversion. Another reason I determined my finished attic costs for construction would be low, there was no exterior work to be done. No demolition, no roofs or dormers to add, and no house siding to rip off and replace. Unlike a house extension, finishing an attic requires no excavating work. Thus, there is no foundation to have to install with an attic conversion project. Excavation and foundation work are very expensive, and time consuming to a construction project, and as everyone knows “time is money”. All I had to do for framing was install a couple of knee walls along the front and back of the attic and frame out a closet area. Get this Room Addition over Garage Bid Sheet. I did this work myself and completed it in one weekend. Also, I had used 2×10 ceiling joists in the garage addition, so effectively I had 2×10 floor joists for the attic floor. No sistering of larger attic floor joists was required. I estimated my finished attic costs to be $7,350. Below is a breakdown of my finished attic costs. Sheetrock and Trim – $2,500; I contracted this work out. Electrical – $500; I did the work myself, which involved installing a number of outlets/switches and a couple of overhead ceiling lights. Heating – $2,000; I had a third hot water heating zone put in buy a plumber. Trim – $400; I did my own finish carpentry trim work. Of note, I did not require any additional plumbing other than the forced hot water heating elements that I had installed. So, my advice to anyone thinking about a finished attic conversion project is, if you have easy access to the attic, there is plenty of headroom and natural lighting already in the attic, and little additional interior structural framing is required, then your attic is ripe for finishing. 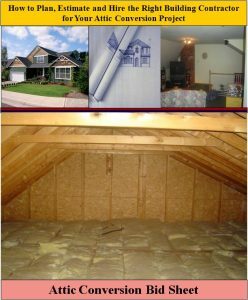 Moreover, your finished attic costs should be low. To conclude, I estimate the average cost of a finished attic conversion should be in the range of $10,000 to $15,000, even for those that contract out much of the work to subcontractors. 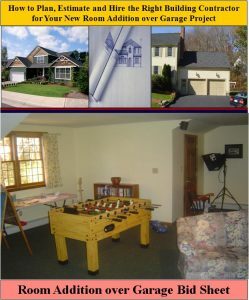 For help on Attic Conversion and Attic Renovation Projects, see HomeAdditionPlus.com’s Attic Conversion Bid Sheet. The Attic Conversion Bid sheet will help to ensure that you hire the right contractor so that your attic conversion project is built correctly, on time and budget.